All Types Welcome…to stereotype nursing! Lionsgate has promoted its popular Saw horror film franchise with blood drives, using posters exploiting the naughty and battle-axe stereotypes of nursing. For this month’s series entry Jigsaw, the posters push gender boundaries as a way of protesting the restrictions on blood donations by those in the LGBTQ community. But the imagery still undermines the very nurses who use the blood collected to save lives, because it presents “nurses” as exotic gender objects, some with sexual and/or unsettling elements, and most of the images can’t be reconciled with an ungendered modern health profession. October 2017 – Since 2004, Lionsgate’s popular Saw horror film franchise has promoted its new releases with blood drives, which have been driven by posters exploiting the naughty and battle-axe stereotypes of nursing. For this month’s series entry Jigsaw, the theme is “All Types Welcome.” The 8 posters in the new campaign feature well-known models pushing gender boundaries, as a way of protesting the continuing restrictions on blood donations by those in the LGBTQ community in the United States. 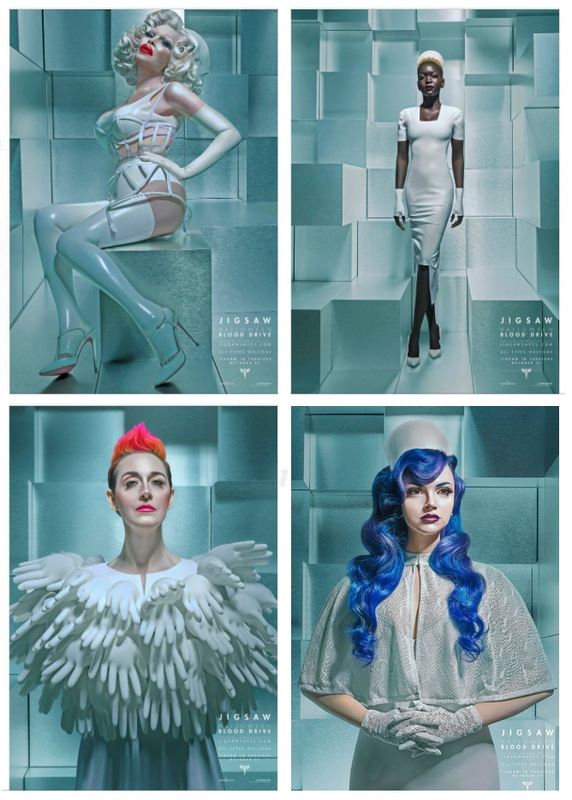 That is admirable, but it remains unfortunate that Lionsgate and its “chief brand officer” Tim Palen are still promoting the campaign with imagery that undermines the very nurses who use the blood collected to save lives. The new images are certainly diverse in terms of gender and race, some are not especially sexual or scary, and viewers might not readily associate some with nursing, if not for the context and history of the blood drives—and the fact that the campaign site’s main page does say “MEET THE NURSES.” But the images still tend to present the “nurses” as exotic, ephemeral gender objects, some with sexual and/or unsettling elements, and in that sense they are true to the tradition of these campaigns. There is simply no way to reconcile most of the images with an ungendered modern health profession. Perhaps ironically, the two most traditionally “male” images definitely come closest. This kind of imagery has long undermined real nurses’ claims to the respect and resources they need. It’s also unfortunate that the American Red Cross has honored the studio for these efforts in the past, with no apparent awareness that the campaigns constitute attacks on nursing, although that organization was founded by nurse Clara Barton in 1881; of course, the Red Cross itself does not even mention she was a nurse in its long online biography, so maybe we’re hoping for too much. In any case, we urge Lionsgate, as we have before, to hold the blood drives without the nursing element, and to make amends for the damage these drives cause to nursing. Since Jigsaw will likely bring the global box office for the series to more than $1 billion dollars, the company can afford to do so. Please click here to join our letter-writing campaign. Ask Lionsgate to find a way to recruit blood donors that does not suggest nurses are exotic gender objects. Thank you!